A 60-year-old concept about the structure of the magnetic fields around Planet Earth has been confirmed openly for the first time ever in recent issued research paper. The main author of the paper is surprisingly an undergraduate student who devised a way to view the Earth's magnetosphere in three dimensions. The sun releases a continuous stream of charged particles that's supplemented by cosmic rays from causes such as supernovae. 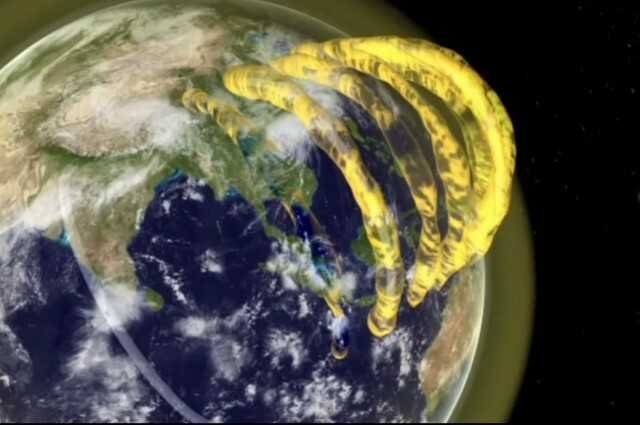 As these particles touch Earth, their route is altered by the Earth's magnetic field, which bounces some and funnels others towards the poles, leading to awesome views such as aurora. This area, known as the magnetosphere, contains the ionosphere and plasmasphere as its inner layers. These differences aside, we don't know all that much about the arrangement of these areas. A better understanding would be valuable because the ionosphere affects satellite navigation systems and the pictures received by radio telescopes. During her honors project at the University of Sydney, Cleo Loi recognized she could use the Murchison Widefield Array (MWA) radio telescope to analyze these areas in a way that had never been done before, leading to a paper in the journal Geophysical Research Letters. The MWA is a forerunner of the Square Kilometer Array (SKA), momentarily to transform radio astronomy. It contains 128 antennae spread over three kilometers. Loi proposed that by splitting the observations amid those from the eastern and western ends of the array, she would attain something equal to binocular vision, letting us to see in three dimensions. For the MWA's usual astronomical work, a three-kilometer baseline does not give the parallax compulsory to see in-depth, but the condition is very diverse when we are looking close to the Earth. Loi spotted a series of high and low density plasma tubes linking the ionosphere and plasmasphere moving in parallel to the magnetic field. Loi said "We measured their position to be about 600 kilometres [373 miles] above the ground, in the upper ionosphere, and they appear to be continuing upwards into the plasmasphere. This is around where the neutral atmosphere ends, and we are transitioning to the plasma of outer space," The tubes move gradually with time, so telescopes experience altering interference effects. Loi told IFLScience that while some narrow probing has been done on the ionosphere with other radio telescopes for example the Very Large Array, no one to her knowledge has used parallax to the problem previously.